Cloud Peak is the highest peak in the Bighorn range of north central Wyoming, a cirque on its east side hosts the only significant glacier in the range. This glacier was photographed in 1903 and has lost much of its volume since then. Rahn et al. 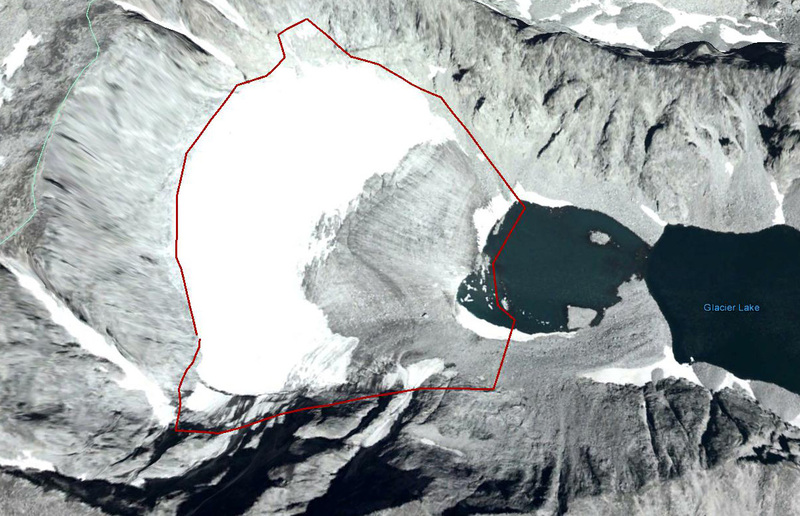 (2006), page 44, estimated that if the melting continues at the rate that determined in 2005, Cloud Peak Glacier would disappear between the years 2020 and 2034. They used repeat photographs to estimate glacier volume as 506 million cubic feet in 1905, 205 million cubic feet in 1966 and 78 million cubic feet in 2005. The latter value is likely too low, as it implies a glacier thickness of just over 10 m on average, yet there is active crevassing, which typically requires 30 meters of thickness. A typical volume-area scaling law also yields a thickness of 30 m (Bahr, 2014). Here we use Google Earth images from 1994, 2006 and 2010 to observe more recent changes. 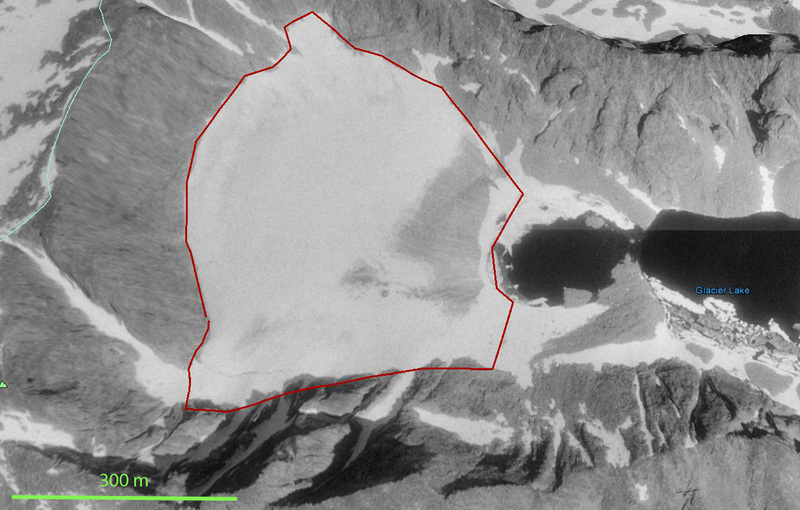 The red line is the outline of the glacier in 1994. In 1994 the glacier had a length of 580 m on average across the glacier front. The glacier had retreated 280 m from the Little Ice Age moraine crosscutting the lake. 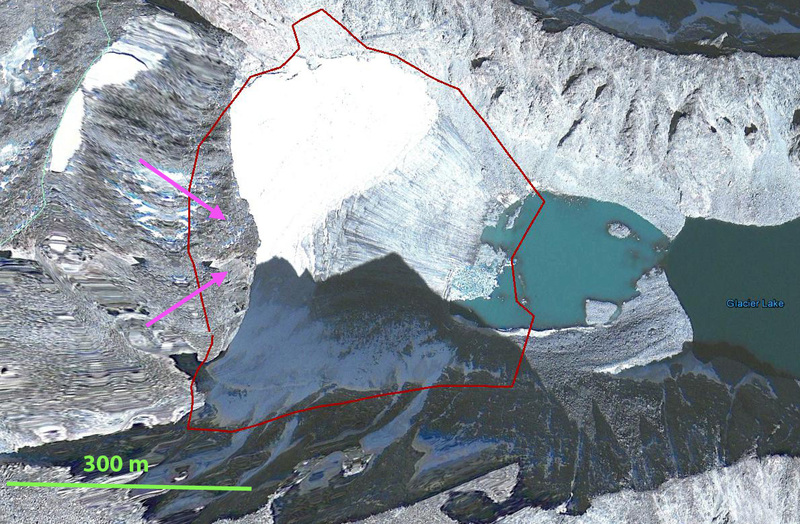 By 2006 the terminus has retreated 65 m. In 2010 the terminus has retreated an average of 105 m. Just as importantly the top of the glacier has receded 75 m, pink arrows indicate this area. The net results is that total glacier length has declined from 580 m to 380 m on average. The glacier has an area in 2010 of 0.20 square kilometers. Given retreat of the top and bottom of the glacier the glacier will not survive (Pelto, 2010). However, the glacier will not disappear in the next two decades unless the melt conditions increase substantially. This retreat is similar to the nearest glaciers to the north in the Beartooth Mountains of Montana and to the west in the Wind River Range of Wyoming. This entry was posted in Glacier Observations and tagged bighorn mountain glacier melt, cloud peak glacier retreat, wyoming glacier retreat. Bookmark the permalink.